When a user selects a color in the color picker after clicking a submit button, the value is recorded and visible on the submission! Yes, I believe that may be possible. Copy the code you have to Pastebin.com or some other similar repository and paste the link here, so that we can have a look at it and see how best it can be integrated into the form. What I can state with certainty is that the form's source will have to be copied from the Embed Form Wizard, edited and then pasted into a web page because the color picker cannot be inserted using the form builder. Is there a particular web page from which the color picker was obtained? If so, just posting the link to that page should suffice. If there's more than one color picker on the page, just let us know which of them is the one you'd like to use. After giving this some more thought, it seems that getting the value picked recorded in the submission should actually be a pretty simple task. 7. Search the source of the page for the input classed form-textbox to which the color picker is to be attached and add a class named color. In other words, class="form-textbox" becomes class="form-textbox color"
Here's a page containing a demo form. If you view the source of that page, you'll see the changes described above. Complete and submit the form and in the autoresponse you'll see the hex code of the color that was selected. Very thanks for you reply! is different because have a images, it invokes the operation and the look and feel is better! You can help me? it off? Thanks for all you're a GREAT! Load your iColorPicker.js after jQuery gets loaded. It will be a upgrade with a dedicated tool? I'm not aware of any plans to implement this feature but I'll submit a ticket for you. It would be great to have a color picker added to the form builder!!! @abajan I could use your help. I followed your instructions and made an HTML document and put the jscolor folder and html file in my wordpress theme folder - and it works great. I was simply going to link to the html page with the form. Then I decided I would make a Page Template for my wordpress theme and embed the source code there for my form. This also works fine. I have it working now. My problem: The CSS (appearnce) of the form in the HTML file version looks really nice compared to the form in my wordpress page template. Is it because the form is inheriting form CSS from my theme? I've only recently started digging into making my own WordPress themes. For now the form works great, and the color picker options works perfectly. I just wished the styling and layout of the form was the as how I built it in JotForm. Any help and indeas would be greatly appreciated. http://www.jotform.com/contact and we will attend to it as soon as we can. Just copy/paste your message here on the new created post to speed up your post. As a hint, since you are using the form's source code embed on your WP page, the answer is YES. 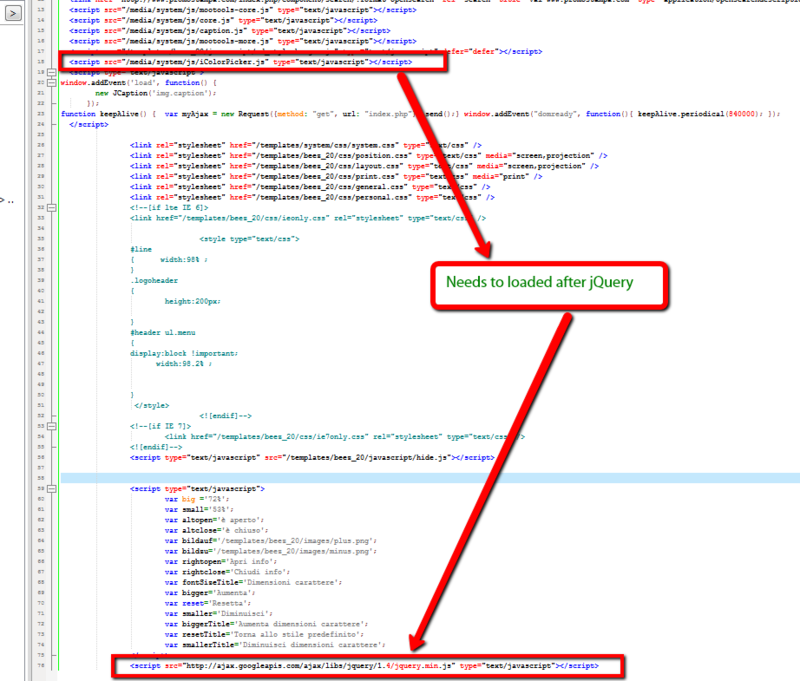 The form is inherithing the theme of the WP page. 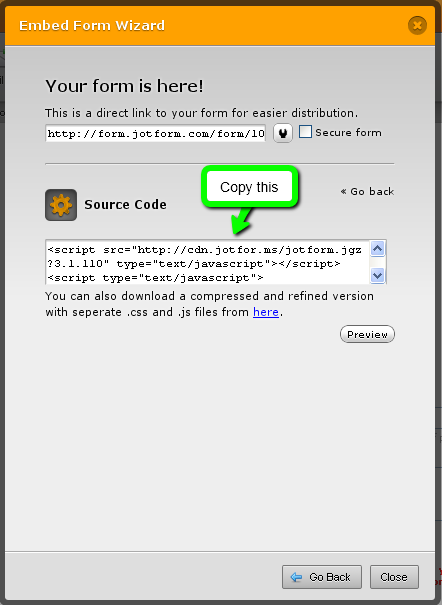 You can try embeding the form's page within an iframe code into your WP page. This way it will not use the WP stylesheets. I vote for this "feature" too. we have no way to use the full source code as our site is on wix. only iframe will work ok. it would be nice to have a way to plant this in an iframe, let me ask, is there a way to copy/paste the js color picker code into the html text box thingy or that wont work out? Kindly open a new thread so we can better track the issues, requests and solutions users are having. To assist you better and avoid confusion. Thank you and looking forward to assist you.